U.S. Rep. Gwen Graham at Florida State University New Student Convocation Sunday, Aug. 23, 2015. 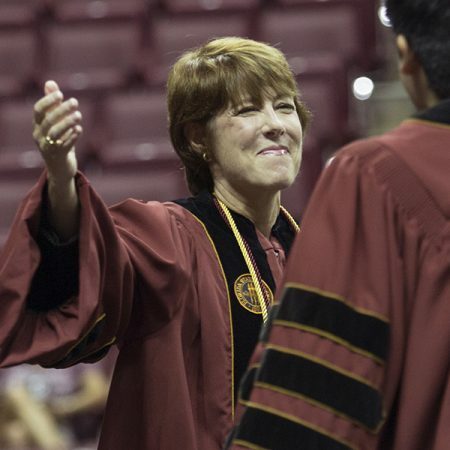 Congresswoman Gwen Graham didn’t speak as a politician during her keynote address at Florida State University’s New Student Convocation at the Donald L. Tucker Civic Center Sunday, Aug. 23. Instead she offered wisdom from her experience as a mother and gave Florida State’s Class of 2019 the same advice she shared with her three children when they went off to college. The annual event officially welcomes first-year students into the university’s community of scholars and introduces them to the university’s values and traditions on the eve of the first day of the fall semester. Most of Florida State’s 6,200 incoming students attended the hour-long ceremony, joined by friends and family. The new students are among about 42,000 students who will begin classes at Florida State on Monday, Aug. 24. Deans and administrators enter through a processional during the Convocation ceremony. President John Thrasher welcomed the new students, and Interim Provost Sally McRorie encouraged the Class of 2019 to take full advantage of the academic opportunities that are available to them and make one of Florida State’s award-winning faculty their mentors. FSU Student Body President Jean Tabares challenged the new students to utilize all the university has to offer before introducing Graham. Dean of Undergraduate Studies Karen Laughlin called upon students to commit to live by the values embodied in the torches on the university seal. 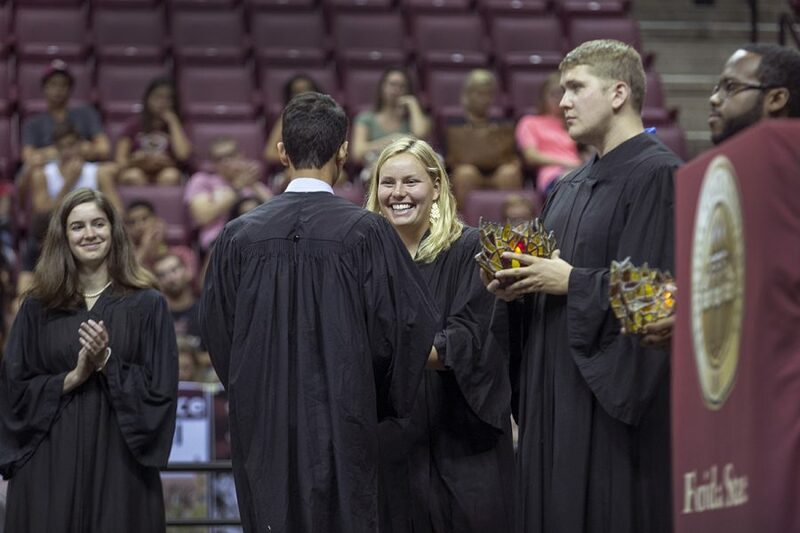 During the torch ceremony, three upper-class students passed torches representing Vires (strength), Artes (skill) and Mores (character) to a trio of incoming students, symbolically passing the university’s ideals from one class to the next. Participating in the ceremony were Lauren Hine, who passed the Vires torch to Gabriel Loring; Daniel Hubbard, who passed the Artes torch to Michael Shelfer; and Qaree Dreher, who passed the Mores torch to Kelsey Burrows. Incoming School of Theatre student Sasha Aparicio read the winning essays. The first-year students were chosen on the basis of essays they wrote about the qualities of the three torches and how they connect with the history and culture of the Seminole Tribe. Dean Laughlin then presented the incoming class of 2015 and led the group in reciting the Academic Honor Policy Pledge. Vice President for Student Affairs Mary Coburn led the Class Pin Ceremony and the recitation of the university’s Seminole Creed. She also discussed the university’s Uphold the Garnet and Gold philosophy and asked all incoming students demonstrate respect for themselves and others, take responsibility for themselves and those around them and reflect the values of Florida State. Students also were taught the Alma Mater, “High o’er the Towering Pines” with assistance from College of Music Professor Kevin Fenton and incoming music student Santiago Arbelaez. McRorie offered a challenge to all students to think about how they would embody the Florida State University ideal, and talked about how students should maximize their choices academically, beyond the classroom and personally. Following the convocation, thousands of new students joined Thrasher and college deans for the President’s Welcome at the Civic Center exhibition hall, which featured free food and entertainment. FSU alumnus Kyle Doney (B.S. ’07, Social Sciences), who once served as Osceola at home football games, represented the Seminole Tribe of Florida and spoke at the event, which featured a live disc jockey and food stations. 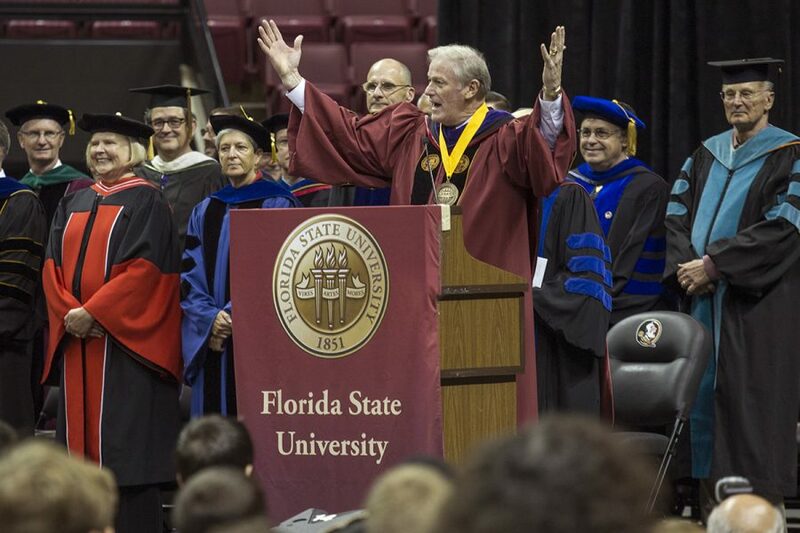 President Thrasher welcomes incoming students to the FSU family at 2016 New Student Convocation. Students symbolically pass the university’s ideals from one class to the next during the torch ceremony. 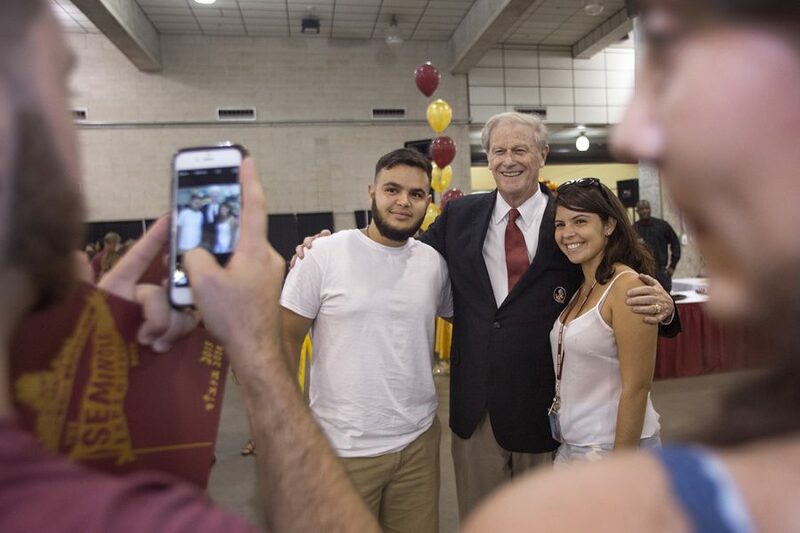 President Thrasher meets new students at the President's Welcome. 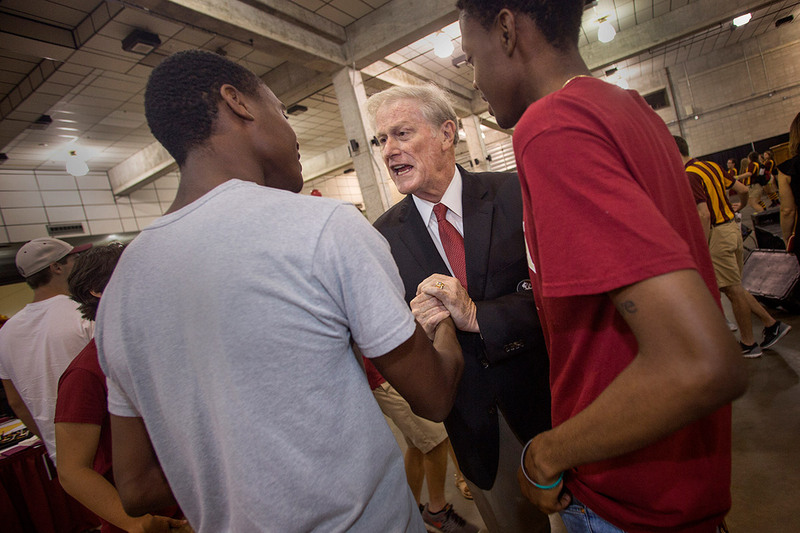 President Thrasher greets students at the President's Welcome.